Do You Know What SMA Stands For? You Should! 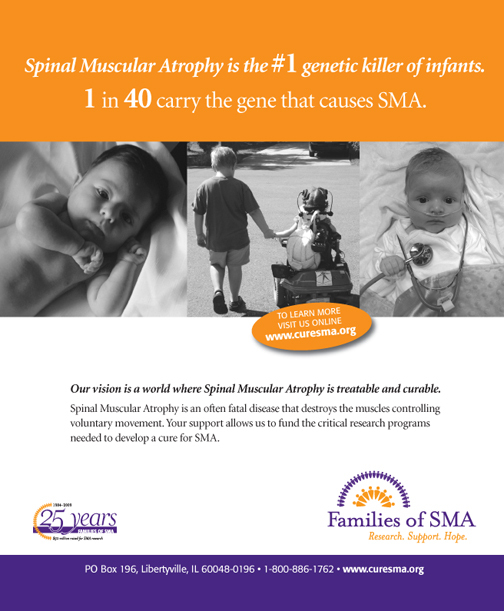 Quick Facts About SMA You Should Know! August is SMA Awareness month when we all try to increase awareness of this devastating disease. Help these beautiful children in the fight of their life. WHO IS AFFECTED? 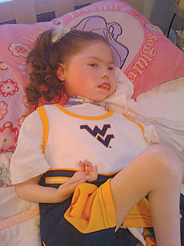 SMA is one of the most prevalent genetic disorders. • One in every 6,000 babies is born with SMA. • SMA can strike anyone of any age, race or gender. • One in every 40 people carries the gene that causes SMA. The child of two carriers has a one in four chance of developing SMA. • 7.5 million Americans are carriers. Autosomal recessive is the mode of genetic transmission for SMA. This means that two copies of the gene are needed in order for the disease’s traits to be inherited. In other words, one copy from each parent. SMA patients are classified into four types based on milestones achieved at the onset of SMA. Types 1and 2 are the most prevalent. The diagnosis of Spinal Muscular Atrophy can be scary and frustrating, running the gamut of emotions… but you are not alone. You are now part of Families of SMA, a network of families, researchers, clinicians and other professionals who are determined to make a difference.